Download "Article 1: Subject. Article 2: Orders - Order Confirmation"
1 GENERAL CONDITIONS OF PURCHASE Article 1: Subject 1.1 The following general conditions of purchase (the "General Conditions") establish the contractual conditions governing the purchase of raw materials, semi-finished products or preparations (the "Goods") and of services (the "Services") by Stevanato Group S.p.A. or by one of the companies forming part of the Stevanato Group (the Company ), from any supplier (the Supplier, and, together with the Company, the "Parties, and individually, a Party ), and with reference to any order relating to the Goods and Services (the Order ) accepted by the Supplier. These conditions cancel and replace all previous general conditions of purchase. 1.2 In the event of conflict between these General Conditions and the conditions contained in the Order, the conditions contained in the Order shall prevail. 1.3 In the absence of a written agreement to the contrary between the Parties, in the event of conflict between these General Conditions and the Supplier's general conditions of sale, these General Conditions shall prevail. 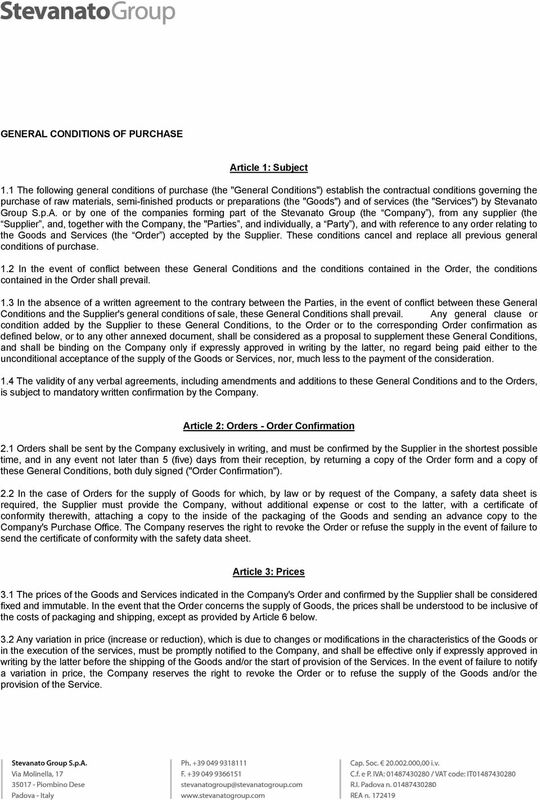 Any general clause or condition added by the Supplier to these General Conditions, to the Order or to the corresponding Order confirmation as defined below, or to any other annexed document, shall be considered as a proposal to supplement these General Conditions, and shall be binding on the Company only if expressly approved in writing by the latter, no regard being paid either to the unconditional acceptance of the supply of the Goods or Services, nor, much less to the payment of the consideration. 1.4 The validity of any verbal agreements, including amendments and additions to these General Conditions and to the Orders, is subject to mandatory written confirmation by the Company. 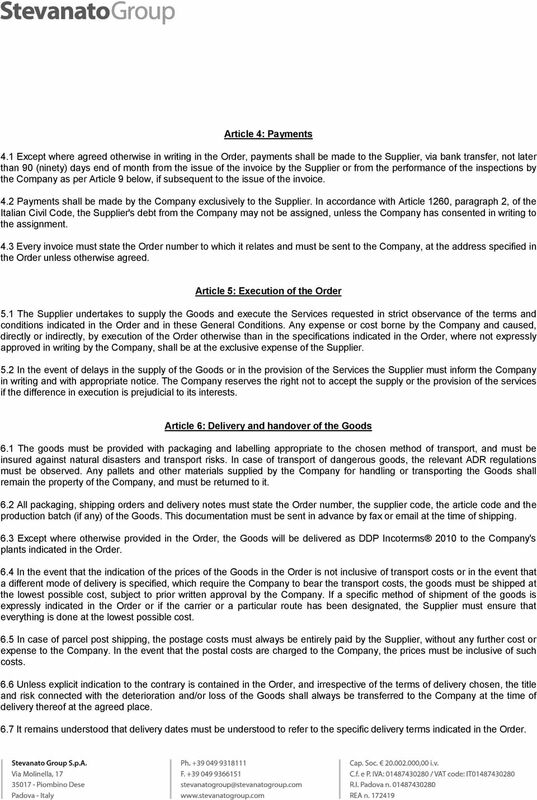 Article 2: Orders - Order Confirmation 2.1 Orders shall be sent by the Company exclusively in writing, and must be confirmed by the Supplier in the shortest possible time, and in any event not later than 5 (five) days from their reception, by returning a copy of the Order form and a copy of these General Conditions, both duly signed ("Order Confirmation"). 2.2 In the case of Orders for the supply of Goods for which, by law or by request of the Company, a safety data sheet is required, the Supplier must provide the Company, without additional expense or cost to the latter, with a certificate of conformity therewith, attaching a copy to the inside of the packaging of the Goods and sending an advance copy to the Company's Purchase Office. The Company reserves the right to revoke the Order or refuse the supply in the event of failure to send the certificate of conformity with the safety data sheet. Article 3: Prices 3.1 The prices of the Goods and Services indicated in the Company's Order and confirmed by the Supplier shall be considered fixed and immutable. In the event that the Order concerns the supply of Goods, the prices shall be understood to be inclusive of the costs of packaging and shipping, except as provided by Article 6 below. 3.2 Any variation in price (increase or reduction), which is due to changes or modifications in the characteristics of the Goods or in the execution of the services, must be promptly notified to the Company, and shall be effective only if expressly approved in writing by the latter before the shipping of the Goods and/or the start of provision of the Services. In the event of failure to notify a variation in price, the Company reserves the right to revoke the Order or to refuse the supply of the Goods and/or the provision of the Service. 2 Article 4: Payments 4.1 Except where agreed otherwise in writing in the Order, payments shall be made to the Supplier, via bank transfer, not later than 90 (ninety) days end of month from the issue of the invoice by the Supplier or from the performance of the inspections by the Company as per Article 9 below, if subsequent to the issue of the invoice. 4.2 Payments shall be made by the Company exclusively to the Supplier. In accordance with Article 1260, paragraph 2, of the Italian Civil Code, the Supplier's debt from the Company may not be assigned, unless the Company has consented in writing to the assignment. 4.3 Every invoice must state the Order number to which it relates and must be sent to the Company, at the address specified in the Order unless otherwise agreed. Article 5: Execution of the Order 5.1 The Supplier undertakes to supply the Goods and execute the Services requested in strict observance of the terms and conditions indicated in the Order and in these General Conditions. Any expense or cost borne by the Company and caused, directly or indirectly, by execution of the Order otherwise than in the specifications indicated in the Order, where not expressly approved in writing by the Company, shall be at the exclusive expense of the Supplier. 5.2 In the event of delays in the supply of the Goods or in the provision of the Services the Supplier must inform the Company in writing and with appropriate notice. The Company reserves the right not to accept the supply or the provision of the services if the difference in execution is prejudicial to its interests. Article 6: Delivery and handover of the Goods 6.1 The goods must be provided with packaging and labelling appropriate to the chosen method of transport, and must be insured against natural disasters and transport risks. In case of transport of dangerous goods, the relevant ADR regulations must be observed. Any pallets and other materials supplied by the Company for handling or transporting the Goods shall remain the property of the Company, and must be returned to it. 6.2 All packaging, shipping orders and delivery notes must state the Order number, the supplier code, the article code and the production batch (if any) of the Goods. This documentation must be sent in advance by fax or at the time of shipping. 6.3 Except where otherwise provided in the Order, the Goods will be delivered as DDP Incoterms 2010 to the Company's plants indicated in the Order. 6.4 In the event that the indication of the prices of the Goods in the Order is not inclusive of transport costs or in the event that a different mode of delivery is specified, which require the Company to bear the transport costs, the goods must be shipped at the lowest possible cost, subject to prior written approval by the Company. If a specific method of shipment of the goods is expressly indicated in the Order or if the carrier or a particular route has been designated, the Supplier must ensure that everything is done at the lowest possible cost. 6.5 In case of parcel post shipping, the postage costs must always be entirely paid by the Supplier, without any further cost or expense to the Company. In the event that the postal costs are charged to the Company, the prices must be inclusive of such costs. 6.6 Unless explicit indication to the contrary is contained in the Order, and irrespective of the terms of delivery chosen, the title and risk connected with the deterioration and/or loss of the Goods shall always be transferred to the Company at the time of delivery thereof at the agreed place. 6.7 It remains understood that delivery dates must be understood to refer to the specific delivery terms indicated in the Order. 4 maximum period provided by applicable law. In accordance with article 1490, paragraph 1, of the Italian Civil Code, timely reporting of defects is to be taken to mean reporting not later than 1 (one) month after the supply or not later than 1 (one) month after their discovery, without prejudice to any longer period provided by applicable law. Article 9: Inspections 9.1 All the Goods and Services indicated in the Orders shall not be deemed to have been accepted by the Company until the final inspection by the Company, which is to be made at the Company's plants. 9.2 Any previous inspection made at source and any payment made may never be intended as an exemption of the Supplier from the guarantee obligation provided in these General Conditions or in the Orders, nor may they preclude the Company's right to refuse the Goods and the Services and to exercise the remedies referred to in these General Conditions. Article 10: Safety provisions 10.1 In the supply of both Goods and of Services, the legal or regulatory provisions governing the Goods and/or Services required must be observed, particularly in cases where provision is made for the use of hazardous technical devices or chemical products, or if there is provision for the adoption of preventive measures for environmental purposes It remains understood that the cost of any device or apparatus designed to perform a safety function, and of any measures adopted for the same purpose, shall be borne by the Supplier. 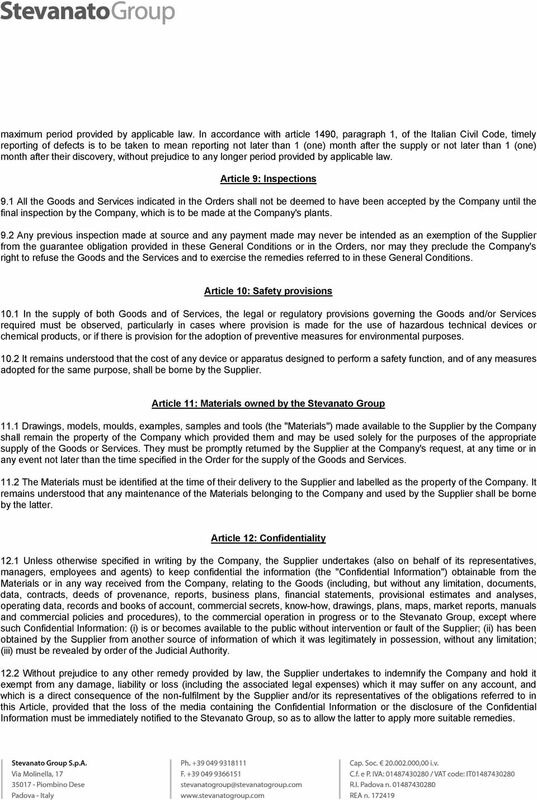 Article 11: Materials owned by the Stevanato Group 11.1 Drawings, models, moulds, examples, samples and tools (the "Materials") made available to the Supplier by the Company shall remain the property of the Company which provided them and may be used solely for the purposes of the appropriate supply of the Goods or Services. They must be promptly returned by the Supplier at the Company's request, at any time or in any event not later than the time specified in the Order for the supply of the Goods and Services The Materials must be identified at the time of their delivery to the Supplier and labelled as the property of the Company. It remains understood that any maintenance of the Materials belonging to the Company and used by the Supplier shall be borne by the latter. Article 12: Confidentiality 12.1 Unless otherwise specified in writing by the Company, the Supplier undertakes (also on behalf of its representatives, managers, employees and agents) to keep confidential the information (the "Confidential Information") obtainable from the Materials or in any way received from the Company, relating to the Goods (including, but without any limitation, documents, data, contracts, deeds of provenance, reports, business plans, financial statements, provisional estimates and analyses, operating data, records and books of account, commercial secrets, know-how, drawings, plans, maps, market reports, manuals and commercial policies and procedures), to the commercial operation in progress or to the Stevanato Group, except where such Confidential Information: (i) is or becomes available to the public without intervention or fault of the Supplier; (ii) has been obtained by the Supplier from another source of information of which it was legitimately in possession, without any limitation; (iii) must be revealed by order of the Judicial Authority Without prejudice to any other remedy provided by law, the Supplier undertakes to indemnify the Company and hold it exempt from any damage, liability or loss (including the associated legal expenses) which it may suffer on any account, and which is a direct consequence of the non-fulfilment by the Supplier and/or its representatives of the obligations referred to in this Article, provided that the loss of the media containing the Confidential Information or the disclosure of the Confidential Information must be immediately notified to the Stevanato Group, so as to allow the latter to apply more suitable remedies. 5 Article 13: Ownership of products and inventions 13.1 In the case of the supply of Goods, the products and inventions, patentable or otherwise, resulting from the processing of the Goods by the Company shall be the exclusive property of the latter. No rights over the Products or Inventions may be claimed by the Supplier or by third party assignees of the Supplier In the case of the supply of Services, unless explicit indication to the contrary contained in the Order, ownership of the drawings, descriptions, calculations and every activity performed by the Supplier or by third parties to whom the provision of the Services has been subcontracted shall be transferred to the Company at the time of their realisation without any additional cost to the latter. The Parties hereby agree with immediate effect that the Supplier or the third parties, and their assignees, shall have no rights over the works resulting from the provision of the Services. Any inventions developed by the Supplier in the course of the provision of the Services, patentable or otherwise, shall be the exclusive property of the Company, without any consideration being due to the Supplier. 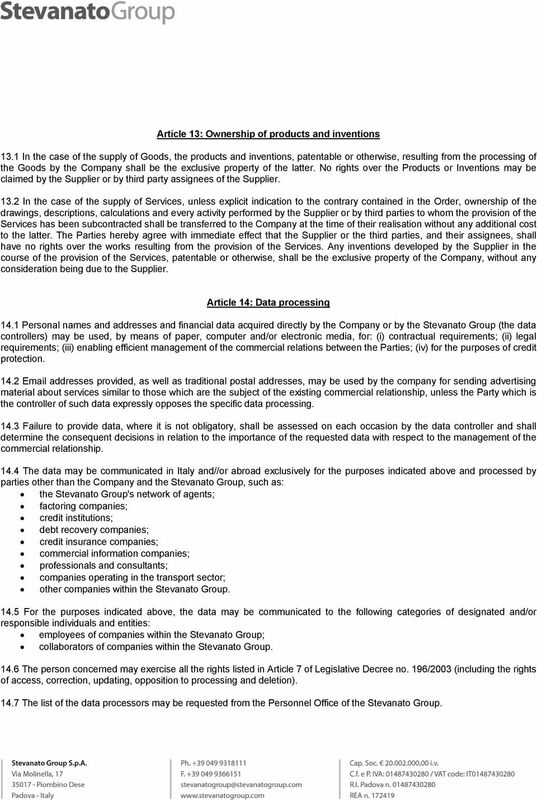 Article 14: Data processing 14.1 Personal names and addresses and financial data acquired directly by the Company or by the Stevanato Group (the data controllers) may be used, by means of paper, computer and/or electronic media, for: (i) contractual requirements; (ii) legal requirements; (iii) enabling efficient management of the commercial relations between the Parties; (iv) for the purposes of credit protection addresses provided, as well as traditional postal addresses, may be used by the company for sending advertising material about services similar to those which are the subject of the existing commercial relationship, unless the Party which is the controller of such data expressly opposes the specific data processing Failure to provide data, where it is not obligatory, shall be assessed on each occasion by the data controller and shall determine the consequent decisions in relation to the importance of the requested data with respect to the management of the commercial relationship The data may be communicated in Italy and//or abroad exclusively for the purposes indicated above and processed by parties other than the Company and the Stevanato Group, such as: the Stevanato Group's network of agents; factoring companies; credit institutions; debt recovery companies; credit insurance companies; commercial information companies; professionals and consultants; companies operating in the transport sector; other companies within the Stevanato Group For the purposes indicated above, the data may be communicated to the following categories of designated and/or responsible individuals and entities: employees of companies within the Stevanato Group; collaborators of companies within the Stevanato Group The person concerned may exercise all the rights listed in Article 7 of Legislative Decree no. 196/2003 (including the rights of access, correction, updating, opposition to processing and deletion) The list of the data processors may be requested from the Personnel Office of the Stevanato Group. GENERAL TERMS AND CONDITIONS OF SALE ART. 1 - INTRODUCTION These General Terms and Conditions, available on the web site of Landi Renzo, regulate the sales agreements between the same Landi Renzo S.p.A.
1.1 The contract shall be deemed to have been entered into upon receipt of supplier s written acknowledgement stating its acceptance of the order. 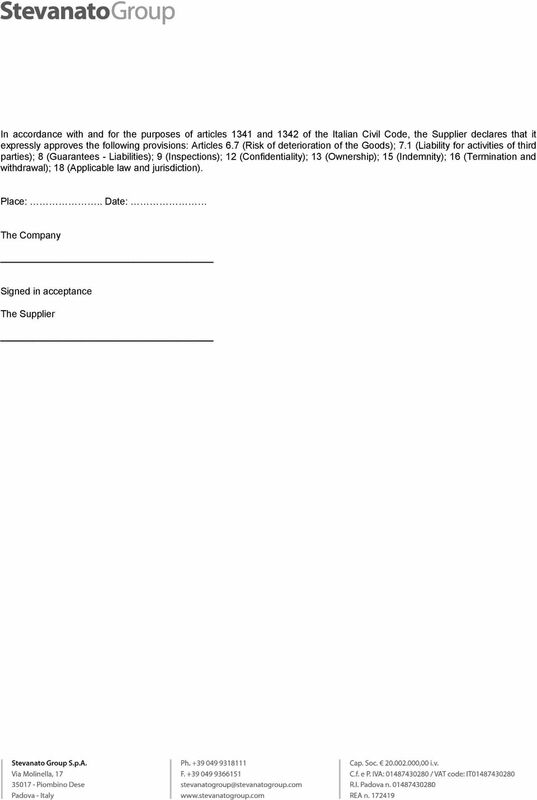 General Contractual Terms and Conditions of KRÁLOVOPOLSKÁ SLÉVÁRNA, s.r.o. Germany I. General 1. The deliveries from L. Brüggemann KG (hereinafter "Seller") are subject solely to the following general terms and conditions of sale and delivery (hereinafter "General Terms and Conditions"). Order prevails to the extent of that inconsistency. PURCHASE ORDER TERMS AND CONDITIONS 1 SUPPLY 1.1 The Supplier must supply and Deliver the Goods to Downer at the Place of Delivery or Place of Pick-up (as applicable) by the Delivery Date for the Price. 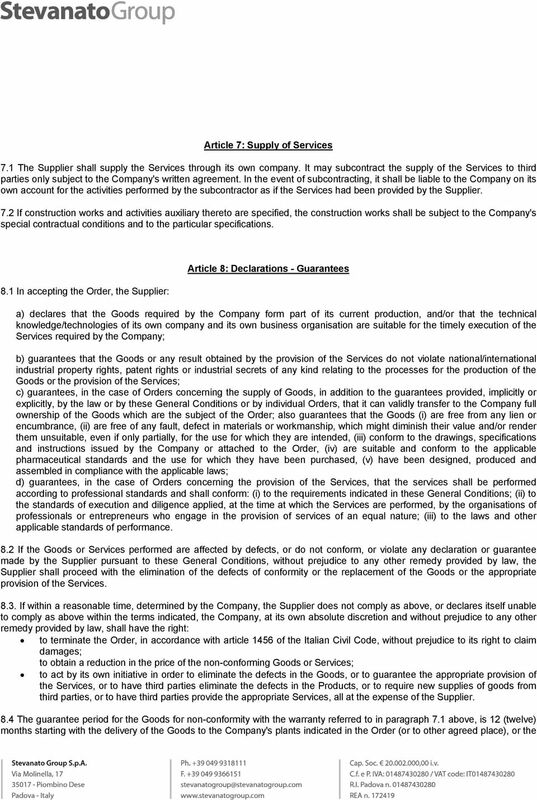 THE CORPORATION OF THE CITY OF WATERLOO (the City ) Purchase Order GENERAL TERMS AND CONDITIONS Terms and Price 1. These terms and conditions form part of every Purchase Order ( P.O. ) issued by the City. 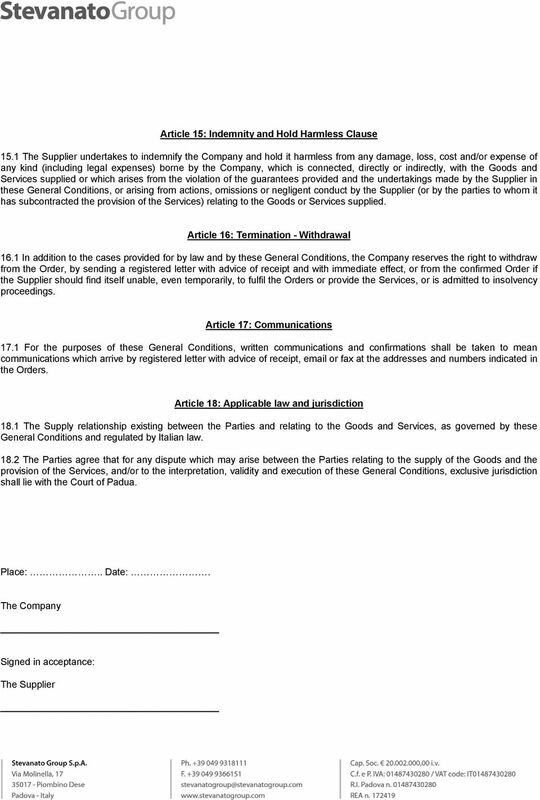 1.2 The Supplier is bound by this Agreement whether or not the Supplier or HWC signs this Agreement.